The signal from the antenna is filtred in a double LC filter. This filter uses small commercial 2.2mH inductors, which don’t have a lot of Q, but are adequate for this purpose. It is the mixed with 125kHz in a very simple mixer using the BF966 mosfet (you can substitute almost any RF mosfet). The IF is filtered in a simple LC filter tuned to 12kHz. The IF signal is then fed into the sound card input, and further processing is done in software. The 125kHz signal is generated by a CD4060 chip, which has both a crystal generator and dividers (8000kHz/64=125kHz). For IF processing I’ve used Spectrum Lab. 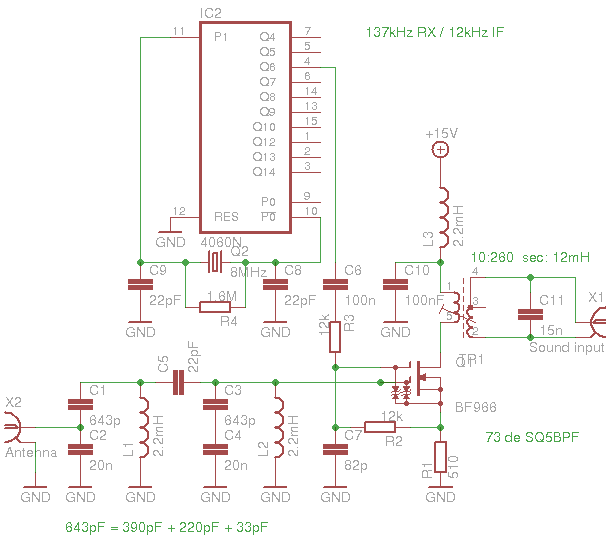 It is easiest to use the SAQrcvr1.usr configuratioon, but enter an offset of 125kHz, so that the frequencies can be read directly from the frequency scale. This will show a waterfall and enable receiving of CW by ear. Other configurations of Spectrum Lab can enable the receiving of QRSS signals. The audio can be also fed into another program, enabling the reception of digital modes WSPR, RTTY etc. 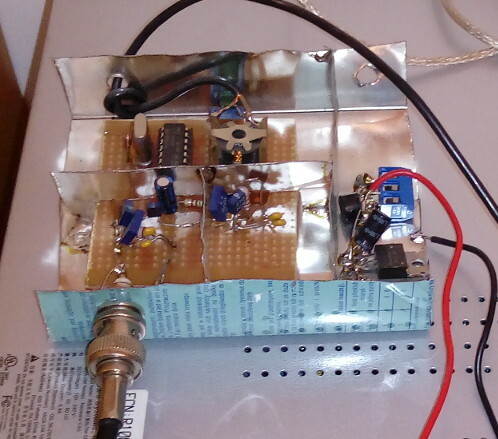 This receiver is not very high quality, but it is very easy to construct, and can be used to get a feel of the 136kHz band. This receiver could be also used on the 472kHz band. All that is needed is changing the input filters and the heterodyne (for example one could use a 3.686MHz crystal and division by 8, which would yield 460.75kHz, so the 472-279kHz band would be downconverted to 11.25-18.25kHz). I can publish the Spectrum Lab configuration files in case anyone is interested.